If you incline going with Internet Café and play MMORPG then, you probably know about TwelveSky 2,a fast-paced Massively Multiplayer Online Role-Playing Game (MMORPG) that combines competitive Faction vs Faction game play with Player vs Environment (PvE) game play. Twelvesky 2 is a remake or sequel of the first Twelvesky MMORG game created by ALT1. 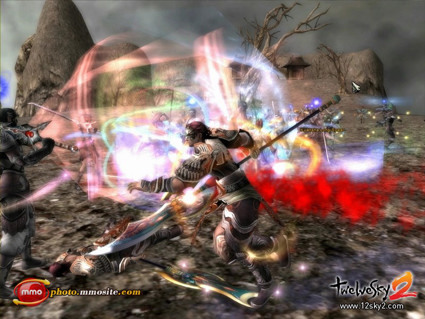 Twelvesky was the latest MMORPG among RAN, MU, Dekaron,Final Fantasy, Ragnarok, Lineage2 and other popular MMORPG in the Philippines.I don’t know when the game was officially release but western servers are more advance in date compared in the Philippines. I have started playing Twelvesky 2 since September 2009. My friend who was an online game addict decided to abandon his character in RAN due to hardships in leveling. He invited me join Twelvesky 2 which was the latest and free to play online. Personally, I hate online games because it’s expensive, addictive, and requires much time to compete with others players but my friend had convince me and we start playing. He teaches me some basic things about MMORPG because he is more advance on it and I easily grasp everything. Every day we play in the nearest internet café to fortify our characters. I loved Twelve Sky 2 because the graphics is something set in reality , the environment, the skills, effects, items, quest, mobs, masters, and the story is impressive. I can say that Twelvesky2 is more real than RAN! Twelvesky2 players are groups into 4 clans; Dragon, Snake, Sky and Tiger Clan. Before, Dragon and Snake is an allies same with Sky and Tiger clan they’re allies too. Formerly, there are 3 servers of Twelvesky.ph; the apocalypse, Bloodlust and the Tempest. The different players face a new challenge when the Bloodlust and Tempest get merged. Actually, there was a change on allies’ rules that greatly affects every clan. Sky Clan was the strongest among clans that even combine forces of different players could hardly defeat them because they are composed of Adept players . Meaning you can only join in Sky Clan if you are in Adept Level. Sky Clan is known the Destroyer in Twelvesky 2 story. Dragon Clan is the largest clan that almost of the beginner starts as a member on it. Snake and Tiger are known as distinct killers and terrible. I belong to Dragon Clan with Heavy Sword character which is outnumbered with the light sword players who dominates the Dragon Clan. My overall impression of Twelvesky2 is a perfect MMORPG, PvP, Clan versus Clan; a nice and easy to learn game. When I start learning Twelvesky2, I have only spent a little money for my internet café time and it’s really exciting when you build your own and it character becomes stronger that could conquer other players. I know a lot of people here in Davao who builds names with Twelvesky 2. Actually, they always won with online battles against Luzon players. But the sad truth they leave Twelvesky2 now! I still play Twelvesky2 till March 2010 but due to my work I can’t allocate a time for it and I come up to realize better things to do . My friend still continues playing until he almost complete the adept level and become a Sky Clan member but lately he decided to quit like others did. My friend and co-players was really disgusted about the system when Game Masters(GM) starts to behave weird. Unlike RAN that GM doesn’t interfere much with players here in Twelvesky 2 they become players opponent. A lot of instances that the Dragon and Sky Clan encounters a ghost characters that has beyond god like attributes like skills, vitality, strength and critical strike that is impossible for a normal player to acquire. The sad thing is, the ghost characters attacks anyone without mercy and even combine forces couldn’t defeat it. Off course, that’s the GM characters which he or she can designed his own ultimate or godlike characters without much effort. Do you think it’s fair? You expense your money to get on the top then, the stupid GM rules like a lion freak rampage you all. Allegedly, some greedy players pay donations to bribe the GM and favor their clan resources like item droppings or create a pre designed heroes for them. For instance I have a lot of money then I would contact the GM that I could pay him PhP 20,000 per month with the following conditions: The GM create an ultimate character for me and he would give me a specific details of item dropping schedule or manipulate items for us. My friends called it “Donator”, the one who bribes the GM. This is the reason drives my friend to quit. If you are going to wander in the Piercing City now then, you will notice the silence and their only few blind players wandering. The GM must work fair. One of the problems of the players in Twelvesky 2 is the item droppings. Why? As you stepping on higher level item droppings becomes rare and rare. Almost of the players works 24/7 to looth for skills, pets, armor, sword and other valuable items which you can rarely find. I am not saying that in RAN item is very easy to find but If you complete a quest or mission skills item is sure to acquire. I mean you need much time to looth for it. If you have much gold then, you can buy it on the market but expect a million costs. Now, the problem was intensifies by Donators issues that item droppings schedule is not fair. My co-players says that noob players didn’t notice the problem and they pick those lost of items drops by adept people without wondering why they are doing that because they gonna leave in Twelvesky 2. Just a gift for those who still not sees the truth. Those who like RAN characters combo skills then, you can’t find it in Twelvesky 2. Other players I know t hate the moves and repetitive skills of Twelvesky 2 characters unlike in RAN you can combine the skills in each attack. Twelvesky 2 cannot be like RAN but it can be improve more than that which we are hoping for. Like other MMORPG Twelvesky 2 is not free forever. Players which encounter problems with skills items contact items sellers and pay to acquire those skills. If you are in adept level you may need an E-coins by buying a game card to maximize your XP or else you become old playing Twelvesky 2 before completing adept levels. Plus your Internet Fee then, your school allowance will be used up. Pero okey din na huminto na cla sa paglalaro ng Twelvesky 2, kawawa kasi mga parents nla. Pinapaaral ng Nursing tapos sa UIC bumagsak. You know about UIC? UIC means University of Internet Café.lol..